The car has more standard performance flourishes than the S, but is not as blistering as the Turbo. The 2017 Porsche Macan GTS, in Carrera white metallic paint, accounted for 20 percent of Macan sales in 2016. It would make sense for Porsche, which makes the world’s best sports coupe in the 911, to plant its performance DNA in the Macan compact crossover, which is the world’s best-selling segment. In 2016, just three years after its debut, the Macan became the best-selling Porsche in North America. Would you take a crossover for spins on the track if you could take a 911? No. But you could haul people, you could haul gear, and you can haul … you know, only the last of which you can do in a 911. The Macan GTS (base price $67,200; as tested, $80,590) hits 60 mph in five seconds, but that number can tick up or down as easily as ticking some Porsche option boxes. Understanding the brand family of Ferdinand Porsche is about as complex as configuring a pickup truck. There are only six models, yet there are endless variations with S, GTS, Turbo and other designations. The GTS is a performance grade above the Macan S, which is an upgrade from the base model that starts under $50,000. It has more standard performance flourishes than the S, but is not as blistering as the Turbo. The main differences of the GTS, aside from some black trim finishes, are a recalibrated engine to boost horsepower and torque, a sport exhaust, standard 20-inch RS Spyder wheels and an active air suspension. It’s about $12,000 more than the S but that much less than the Turbo. The key selling point of the compact crossover is a taller ride height, and compared with the 911, it’s a giant. But the Macan rides lower than other crossovers, which means it looks and handles more like a Porsche than other crossovers. With its coupelike roofline, long wheelbase, short overhangs and low stance, there is no mistaking the Porsche performance DNA. Most importantly, it drives like a Porsche. 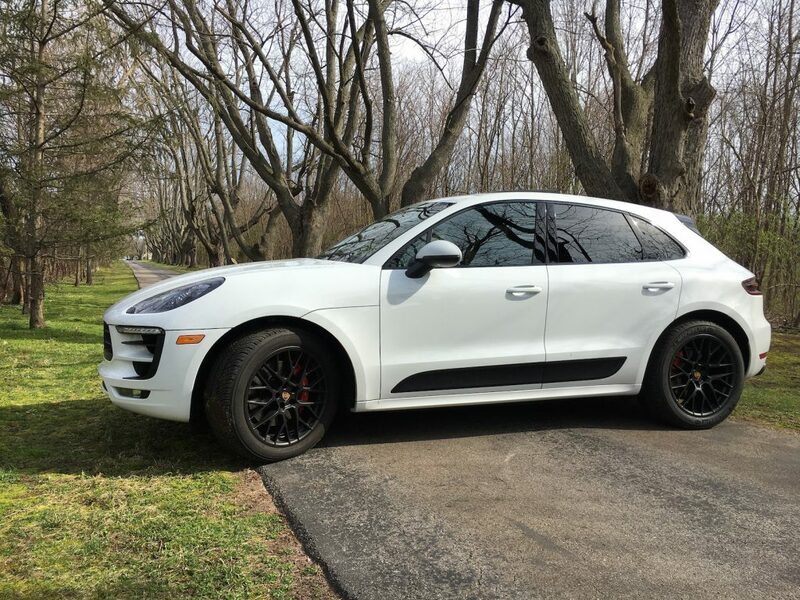 The twin-turbo V-6 engine makes 360 horsepower and 369 pound-feet of torque, improvements of 20 horsepower and 30 pound-feet over the same engine in the Macan S.
Paired to the peerless seven-speed PDK transmission, the Macan is a blast to drive, effortlessly shrugging off its 4,178-pound weight and attacking cloverleaf ramps and corners without the top-heaviness you get in other crossovers. It’s refined around town, acting like a sophisticated adult while dropping off the kids at school, but then it hits the twisties with a rebel yell that is anything but domesticated. It’s a lovely two-face. On road trips, however, the proposition of the performance crossover is watered down. The stiff chassis and sensitivity to the road can be unsettling. On the three-hour way to our destination, a passenger needed me to pull over. Our 80 mph cruising speed, which very well could have been 100 mph without noticing a difference in ride quality, dropped to 60 mph. I hoped it was motion sickness and not something going around in the petri dish known as grade school. But then on the return from our destination, I was the shaky one. We had it in comfort mode, but the stiff racing seats don’t offer much comfort unless you’re whipping in and out of turns. We were not. The performance crossover can be anything and everything – that’s why there are so many out there. But it’s a compromise that isn’t exceptional at any of the many things it can do. Few people can afford to buy a different car for their different moods (oh, but the fantasies it fuels), so the do-it-all package compels. And the Macan GTS does it in distinctive Porsche style. It’s a bit too tightly wound for our tastes on longer road trips, but otherwise it balances performance and panache with aplomb.